Ethiopian soldiers with the African Union Mission in Somalia (AMISOM), after a battle with Al-Shabaab militants on 9 June 2016 in Halgan village, Hiran region, Somalia. Under a unanimously adopted resolution, which maintains AMISOM’s troop deployment “up to a maximum level of 22,126,” the Council sets out further strategic objectives for the mission regarding facilitating the Somali political process at all levels, as well as enabling stabilization efforts, reconciliation and peacebuilding in the Horn of Africa country by providing security for the Somali people. The text also says the AU-led mission would enable the gradual handing over of security responsibilities from AMISOM to the Somali security forces contingent on abilities of the Somali security forces. Among the ‘essential tasks’ authorized by the Council, AMISOM is to engage with communities in the country’s recovered areas and promoting understanding between AMISOM and local populations, to allow for longer term stabilisation by the UN Country Team and other actors. A related ‘priority task’ would be to secure key supply routes, including to areas recovered from Al-Shabaab, in particular those essential to improving the humanitarian situation, and those critical for AMISOM’s logistical support. The text goes on to underline the importance of AMISOM forces carrying out their mandate in full compliance with their obligations under international humanitarian law and human rights law, and cooperating with the UN Assistance Mission in Somalia (UNSOM) and the UN Support Office in Somalia (UNSOS) in implementing the Human Rights Due Diligence Policy on UN support to Non-UN Security Forces (HRDDP). It also calls on the African Union to investigate and report allegations of violations and abuses of human rights and violations of international humanitarian law, as well as continuing to ensure the highest standards of transparency, and conduct and discipline. 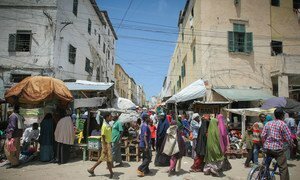 The United Nations Security Council has “condemned in the strongest terms” a recent deadly attack by Al-Shabaab on a hotel in the Somali capital of Mogadishu that killed several people, including a serving government minister.